Yamaha RX-V381 review | What Hi-Fi? Like graduate salesmen, more and more tech goods are expected to go far and beyond what they initially signed up for: smartphones can now start your car, fridges can talk, and kettles turn themselves on to boil. 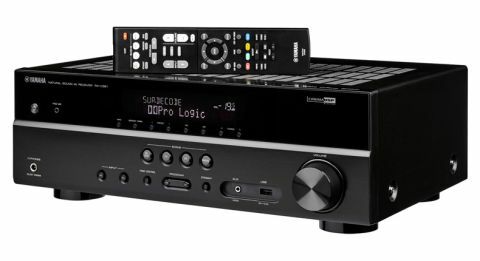 Even with budget AV amplifiers a number of features are becoming almost mandatory requisitions: wi-fi, DLNA streaming, hi-res audio support… all features of the Denon AVR-X1300W (£300), for example. The Yamaha RX-V381, however, flies in the face of all that. This is a back to basics 70 watts-per-channel 5.1 surround amplifier with Bluetooth and an FM/AM tuner. No Spotify Connect. No Dolby Atmos. Not even Yamaha’s MusicCast multiroom technology. Pledging itself as feverishly to the retro revolution as a department store’s homeware section, it doesn’t even have commonplace banana plug inputs for all of its speaker terminals, with the surround and centre channel inputs being less substantial spring-loaded items. So why would you consider buying this amp, you ask? It’s a simple answer – but a good one: performance. It should come as little surprise that the RX-V381 impresses in the sound department. After all, the Yamaha 2016 range of amps has been exemplary, from the £500 RX-V581 to the higher-specified RX-A1060 and Award-winning RX-A3060. The RX-V381 is very much a sonic descendant of these, its primary concern the size and scale of sound it delivers. We turn the lights down and volume up for The Conjuring 2, and the Yamaha duly shows the film to be an exercise in suspense. The ghostly whispers and unnerving rumbles that break eerie silences are atmospheric and enthralling, the amp proving keen to show off its immense scale and enveloping soundfield. Close your eyes (if they aren’t already hiding behind a cushion from the horror on screen) and it may feel as if your speakers are sat further back than they are. The exaggerated reverb on gunshots fires back towards the rear channels with precision – not once is there a gap in their travels – and it has the space so that flurries of strings in the background and the diegetic sound effects aren’t bumping into one another. The RX-V381’s pleasing detail detection means you’re never left in any unintended silences. The more discreet parts of the soundtrack – chirping birds and the slight shimmy of furniture, for example – are all present, if perhaps not quite as subtle as we’d like. It has the dynamism and agility to play into the hands of director James Wan’s penchant for jump scares and instrumental climaxes, and is a little quicker out of the gate than rival Denon AVR-X1300W. There’s slightly greater expression to the opening narration that sets the scene for Ed and Lorraine Warren’s legendary Enfield hauntings case too. It carries the trepidation in Lorraine’s voice and emphasises the monologue’s final utterance of ‘demonic’ enough to make you shudder in your seat. The Denon replies with more solidity, especially in the midrange. Gasps of horror and children’s menacing laughter feel more intimidating, and the heavier creaks of doors more unsettling too, than they do through the Yamaha. Ultimately though, neither amp possesses outright power or punch. The mood-changing introduction of The Clash’s London’s Calling that scores stock footage of quintessential London not only gives you a chance to sit back up in your seat, but also to acknowledge the amp’s energy and oomph as the simultaneous drum and guitar groove fills the front speakers. It’s a nod towards the Yamaha’s musicality, that is confirmed through a stereo performance of Ray Wylie Hubbard’s Dust of the Chase from the Hell or High Water soundtrack. The gruffness of his Texan-twanged vocal is intact, and the acoustic strumming and harmonica that snake through the soundtrack are clear and lively. The RX-V381 doesn’t discriminate between movies and music, nor against people without the space for an idyllic surround set-up. There are digital processing modes designed to emulate surround sound from two speakers (‘Virtual CINEMA’), or five speakers that have been forced to sit at the front of a room (‘Virtual CINEMA FRONT’). It spares a thought for newcomers to the process too. The YPAO set-up software, which measures everything from your speakers’ connectivity, phase and distances to your room’s acoustics and calibrates accordingly, is one of the simplest we’ve come across. And, as if under the pressure of the Countdown countdown, it’s one of the quickest too. It has Rachel Riley’s level of accuracy too, its calculations more or less spot on. The lack of banana plug outputs is a shame in that the amp requires unterminated speaker cables, and relatively thin ones at that. Still, we’ve no complaints elsewhere on the rear panel, where four HDMI inputs and one output – all HDCP2.2-certified for 4K, HDR and BT.2020 pass-through – join single optical and dual coaxial inputs, a handful of analogue connections, and an FM/AM antenna. Just because an alarm clock doesn’t have multi-coloured lights or a choice of TV theme tunes to wake you up doesn’t make it a bad alarm clock. And that logic applies here. By prioritising the core functionality of an amplifier – to make things sound big, loud and engaging – the Yamaha puts in a solid performance that, while not the last word in punch or solidity, is more than dutiful in most sonic areas. For purists who don’t need Spotify this and wi-fi that, or perhaps have access to those features elsewhere in their system, the Yamaha RX-V381 should be seen as functionally streamlined rather than detrimentally spartan.